Discussion in 'Random Topic Center' started by DarkLordSigma, Nov 25, 2007. 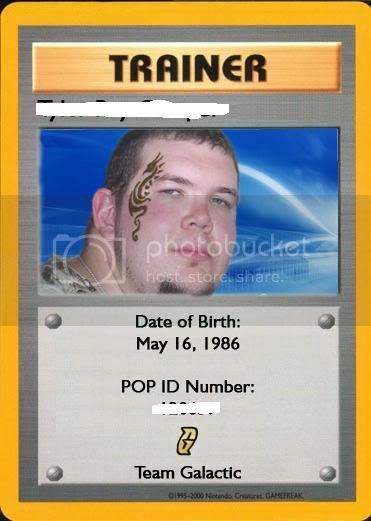 I got the card blank off of www.pokemonzeo.com (credit to them since I erased their logos for asthetic purposes). I'm going to go to a local office supply store to get these printed on heavy card paper, then laminated. Unfortunately I havn't been able to find a place the prints plastic ID cards. Very nice! Now all you need is a suitably picturesque background with one or more of that person's favorite Pokemon in it. Back in the sevii islands season anyone who completed it got a card and you got a credit card size pop id card thing. Plastic and all. Yeah, I wanted one of those, but league attendance kinda dropped off back then. We're getting back strong, with around 17 members per session. I'm going to try to find a place that prints plastic ID cards, but if that fails I'll just get them printed on heavy card stock and laminated. the professor/POP ID cards that went to the 'grandfathered-in' professors after the changeover from WotC to PUI were plastic credit-card style. Hey, DIY stuff is always better. The only storebought thing I use are the cards and sleeves. Polished aluminum briefcase-style gun cases make waaaay better deck boxes than Ultra-Pro could ever hope to make, and they're cheaper!